New York City in the year 2095 is far from the Big Apple we know today. For starters, the population is dominated by aliens and mutant humans, including Jill (Linda Hardy), who has no memory, and has displaced organs and other features that make her technically only 3-years-old. Jill looks like a normal (despite her futuristic �hair�) beautiful woman, which makes her appealing to Nikopol (Thomas Kretschmann), a freedom fighter who has unexpectedly been released from prison. Even more interested in Jill is Dr. Elma Turner (Charlotte Rampling), but her intentions are to study this beauty, and discover why she continues to mutate. This film has been compared to Sky Captain and The World of Tomorrow for its digital effects look, and that is unwarranted to say the least. Not only does the Jude Law film feature far superior effects work, but it also has a coherent story and characters we genuinely care about. Bilal�s opus has neither, as he is seemingly concentrating solely on carving out his own niche in an era when films like The Matrix and Dark City have set the bar awfully high. Despite the often pedestrian special effects, there seems to be the blueprint for an engaging, exciting film, but the audience has to spend way too much time trying to keep track of who these characters are, whether they�re human, alien, or half-bird, and how any of their actions are related to what they do next. The key relationship between Jill and Nikopol will surely seem a bit too familiar to those who have ever seen The Fifth Element. Unfortunately, this pair is nowhere near as interesting, charming, and even funny as Leeloo and Korben Dallas, with way too much time being spent on confusing mythology and long, boring looks at CGI landscapes. At first, we genuinely care about these two, and actually want to care more, but with their back stories being unveiled far too slowly throughout the movie, there�s no way we can truly connect with either of them. While it�s difficult to judge the computer generated �actors,� the human performers do a solid job. When asked to perform alongside their computerized counterparts, the humans are surprisingly convincing as well. Rampling is asked to do the majority of this �mixed� work, and she�s good, even though this is basically slumming it for the actress so memorable in Swimming Pool and Lemming. Hardy and Kretschmann are also good as the main pair of players, but, again, we�re never able to totally gel with these two thanks to the weak story. It�s really a shame that these performances are wasted, and that Bilal doesn�t quite reel in all of his unique ideas and produce a more engaging movie. Image Transfer Review: This 1.85:1 anamorphic widescreen presentation is a great-looking transfer, full of razor sharp, detailed images. The CGI images look extremely realistic, even when human actors are on screen, with blacks and contrast levels remaining consistent throughout. The color palette is rich when it�s allowed to be, but the majority of the film is dominated by grays and darker colors. Audio Transfer Review: The TrueHD 5.1 mix blows us away from the get-go, with the opening sequence giving us a great preview of the active, dynamic mix we�ll get for the remainder of the movie. The LFE is simply remarkable, and is sure to give your subwoofer a huge workout. Dialogue never suffers, remaining crystal clear at all times. Extras Review: The extras include a 10-minute featurette that focuses on the film�s special effects. There�s also The Making of Immortal, an extensive, 30-minute look at the movie�s production that unfortunately borrows some of the content from the effects piece. Ambition is a wonderful thing, especially when it comes to science-fiction films. 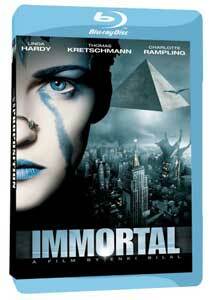 However, too much ambition can hurt a project, and that is the case with 2004�s Immortal. This good-looking misstep makes its Blu-ray debut in with a solid effort from First Look.